Professor Molly Stevens, Professor of Biomedical Materials and Regenerative Medicine and the Research Director for Biomedical Material Sciences at Imperial College London and Deputy Director of i-sense, celebrated 10 years as a Full Professor at Imperial College with a lecture, entitled ‘Materials-based adventures in bioengineering: engineering organs and detecting disease earlier’, on 25 May 2018. Professor Stevens became a full Professor in 2008, only four years after joining Imperial College in 2004, as one of the youngest Professors in Imperial’s history. She leads an extremely multidisciplinary team that exploits biomaterial-based and materials-inspired approaches to answer some of the most pressing and urgent needs in biomedicine. Her research touches a broad range of areas, such as biosensing and point-of-care device development, nanotechnology, tissue engineering, biomolecular recognition, advanced imaging, and regenerative medicine. Prof Stevens performs excellent research across multiple fields and has been awarded with numerous accolades. 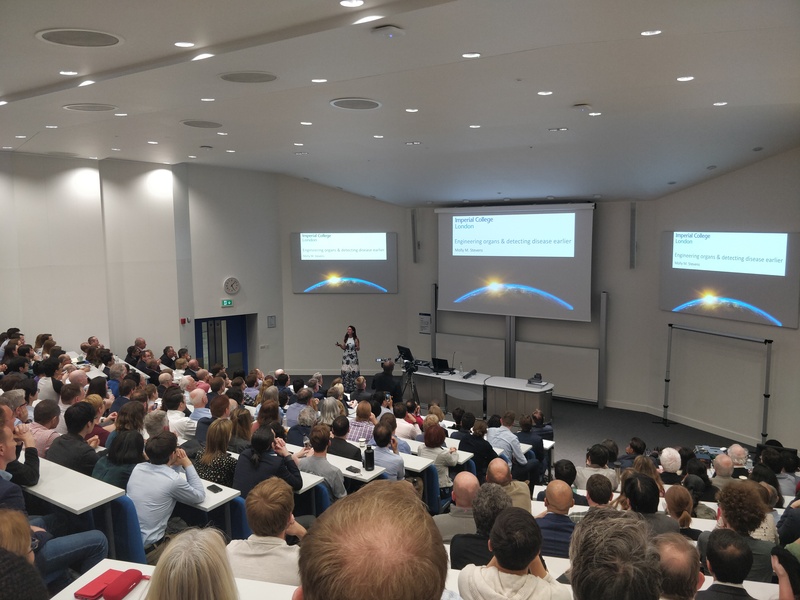 The Stevens’ Inaugural Lecture was delivered to a packed audience of more than 350 invited guests, including collaborators, colleagues, alumni, current group members, and family. Over 100 alumni and collaborators from all around the world attended the event. Professor Stevens showcased numerous exciting outcomes from her research programme and highlighted the activities in i-sense. Her recent publications in the journal ACS Nano on the ultrasensitive detection of p24, a biomarker of HIV, and the ultraspecific detection of the Ebola virus – and their validation on clinical samples as well as in Uganda – were featured amongst numerous research outcomes. She commented on the ongoing efforts to progress such diagnostic and point-of-care technologies and pushing the boundaries to establish powerful biosensing technologies in areas of need. The i-sense team wish to extend a huge congratulations to Professor Stevens and her team of postdoc and student researchers, current and alumni! The past 10 years have been a massive success and an inspiration to us all.